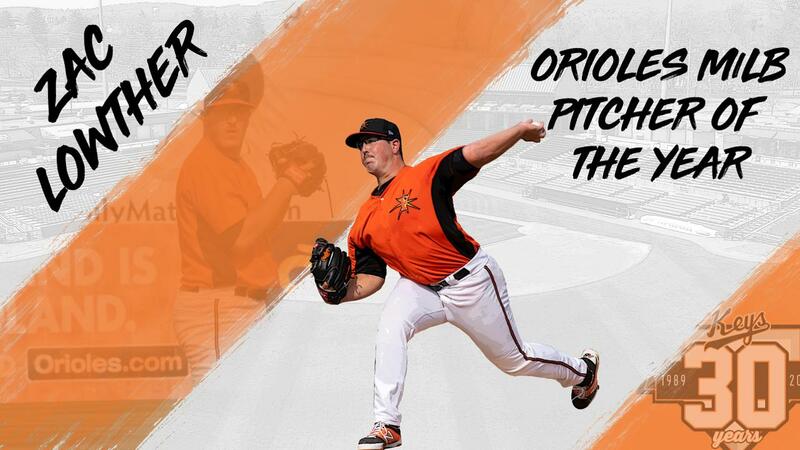 FREDERICK, MD-On Friday morning, the Baltimore Orioles announced that Frederick Keys starting pitcher, Zac Lowther, has been named the Jim Palmer Minor League Co-Pitcher of the Year. The left-hander becomes the first Keys player to win the award since 2012, when Dylan Bundy earned the honor. Lowther shares the award with former Keys starting pitcher, Keegan Akin . Lowther, 22, went a combined 8-4 with a 2.18 ERA in 23 games (22 starts) for the Keys and Low-A Delmarva Shorebirds. In 123.2 innings, he allowed 33 runs (30 earned) on 86 hits to go with 35 walks and 151 strikeouts. The former Xavier product led all Orioles minor leaguers in ERA and strikeouts. In 17 starts with the Keys, Lowther finished 5-3 with a 2.53 ERA in 17 games (16 starts). He allowed only 74 hits in 92.2 innings to go with 100 strikeouts and 26 walks. Opponents batted only .220 against him while he limited left-handed hitters to a .207/.280/.288 slash line and a .568 OPS. Finishing the year strong, Lowther tallied a 1.86 ERA (48.1 IP/10ER) in his last eight contests to go with 51 strikeouts. Five of those eight games were quality outings. Twice named the Orioles Minor League Pitcher of the Month (April and June) Lowther registered a 0.42 ERA in four June starts for Frederick. He surrendered only one earned run in 21.1 frames. Promoted from Delmarva on May 28, the southpaw also was the organization's pitcher of the month in April. Before his call-up to the Keys, Lowther went 3-1 with a 1.16 ERA in six South Atlantic League starts with the Shorebirds. Allowing only four earned runs in 31 innings, he struck out 51 and walked nine. Selected by Baltimore in the second competitive balance round in the 2017 draft out of Xavier, Lowther is the highest-drafted player in Musketeers history. Akin earns co-pitcher of the year after being named the Eastern League Pitcher of the Year. With the Double-A Bowie Baysox, he went 14-7 with a 3.27 ERA. Cedric Mullins was named the Brooks Robinson Minor League Player of the Year. Lowther, Akin and Mullins will be honored in an on-field ceremony on Saturday, September 15 before the Orioles game against the Chicago White Sox. The Keys will host the Carolina League All-Star Classic presented by Visit Frederick on Tuesday, June 18, 2019. For more information about the game as well as more details about the 2019 regular season fans can visit frederickkeys.com.